Bill Chambers...founder of the Dead Ringer Band, half of Bill & Audrey, and award-winning singer, songwriter and multi-instrumentalist. He won a Golden Guitar award in 1992 for writing Things Are Not The Same On The Land which was recorded by Slim Dusty. He has spent the last few years touring the World as part of the Kasey Chambers band. 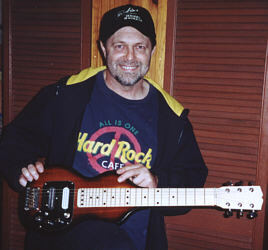 Bill is pictured with a Tomkins Special lap steel guitar.